An Island in Phuket can be Phi Phi Island, Koh Racha, Koh Maiton, Koh Yao Noi (where Koh means island) or all the islands in the Phang Nga Bay. The sheer number and variety of island in Phuket makes a Phuket island hopping adventure a must and one of the wonders of Thailand. The Island in Phuket can be split in to 2 main categories, sightseeing and islands to stay on. 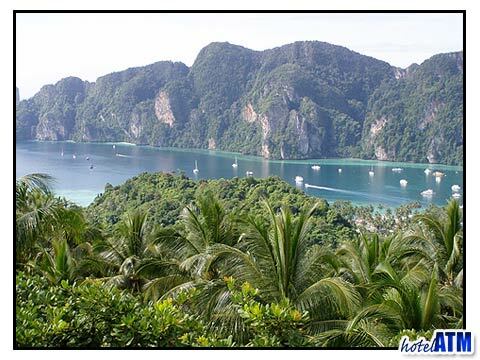 Some of the islands like Phi Phi Island, Koh Racha, Koh Maiton, Koh Yao Noi have hotels and resorts whereas the snorkeling island of Phi Phi Ley or Koh Khai and the Kayaking island of Koh Panak are more famous for Phuket tours. The main tours to island in Phuket are "Phi Phi Island & Maya Bay by Sea Angel cruise ship", the "Phuket Phi Phi Tour by fast Speedboat", The "Magical Phang Nga Bay Cruise June Bahtra", "Phang Nga Bay caves by kayak adventure", and the "3 Dives to Shark Point, King Cruiser and Koh Doc Mai". The tour comparison information and booking procedure can be found from this link Phuket Tours. These Phuket tours offer a mixture of sightseeing with the Sea Angel cruise or Speedboat tour to Phi Phi, sailing to the Phang Nga Bay, kayaking in the caverns and diving out at Phi Phi Shark Point. By the very nature of getting on a boat, these are all adventure tours. Phi Phi Island in Phuket is just 45 minute speedboat away from the east coast of Phuket. The fast and large ferries take about 1 hour and 30 minutes. There are 60 Phi Phi Hotels which include 5 star resorts down to very inexpensive and locally run guesthouses like Harmony Guesthouse for 10 Euro a night. This ensures there is always somewhere for a visitor to stay. As well as the stunning scenery and wonderful 20 km long coral gardens for snorkelers and divers, there are delightful beaches, great mountain walks, unique tours like the snorkeling shark watch, cliff jumping and more. Phi Phi has a fun and distinctive nightlife with cafes, restaurants, beach bars and beach clubs. Phi Phi Island is also famous for it's seafood. Koh Racha is 30 minutes south of Phuket island way out in the beautiful Andaman sea, a truly exceptional island that has first class diving with excellent visibility. Resorts like the Ban Raya Resort And Spa start from 47 Euro and are well-reviewed. This island get-away is large enough to spend some days beach combing snorkeling and diving or perhaps trekking through the jungle covered hills. The The Racha is the elegant 5 star luxury resort on the island. The Maiton Resort is an intriguing Island in Phuket. It lies just 20 minutes off Phuket town and is passed on your way out to Phi Phi Island. It is very small island and the 4 star resort is everything that is man-made there. However the remoteness, the diving and snorkeling and the fine dining make this resort worth discovering. Koh Yao Noi Resorts are not famous because Koh Yao Noi is stunning to look at but because it is surrounded by the series of cliff islands of Phang Nga Bay in whatever direction you decide to go. This picture perfect scenery is the back drop for some excellent resort accommodation on a quiet under populated, rural and charming island. This island is large enough to have "flat" biking tours so you can get to explore at your own pace. Very rewarding and peaceful, this island destination is highly recommended by hotelATM.com and phi-phi.com.